Topics: Delivery Info, How To Order, and Secure Site-shop With Confidence. It is hosted by Novator England, using Apache web server. Its 3 nameservers are authns2.ftd.com, authns1.ftd.com, and authns3.ftd.com. 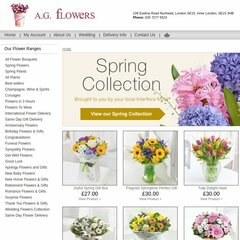 A-gflowers.co.uk's server IP number is 212.118.239.98.